Today brought the sunshine here in Minnesota, and as much as I loved the cold, crispy 20F walk to the bus stop this morning, it was nice to enjoy the sunny, warm and very melty walk to the bus stop this afternoon. The end of winter is in sight, and although it is one of my favorite seasons all this snow in the city means it’s a pain to get around. I’m tired of climbing mountains and trying to squeeze small people into the min-van in between piles of snow. I’m also ready to be done with the “where is my mitten??!!! (shriek loudly, repeat, repeat, repeat) saga we seem to go through with at least one boy a day. I’m also ready to be done fighting with Spinner about the fact that yes, you do need to wear a coat outside when it is below freezing, and then even a little above freezing. So and end to winter? Yes, I think I’m ready for it. This beautiful, 100% alpaca pile of stockinette and ribbing is destined to be Jared Flood’s Redhook. Did I even mention I cast on for this? Probably not. I think I started it in October? I know I started it at a visit to my parents. Either way, it’s been long enough. But add a button band and I’m DONE. This item is more painful. Destined to be Xeriscope in Madelinetosh DK, color Mare. Except I do not pay attention to details, apparently, and think that 225 yards is the same as 250. So my scarf is a foot from being done, I am out of yarn, and not a skein of Mare is to be found. And I’m not even sure I want to spend another $20 anyway. Plus it’s not as drapey as I’d like; I think I should go up a needle size. 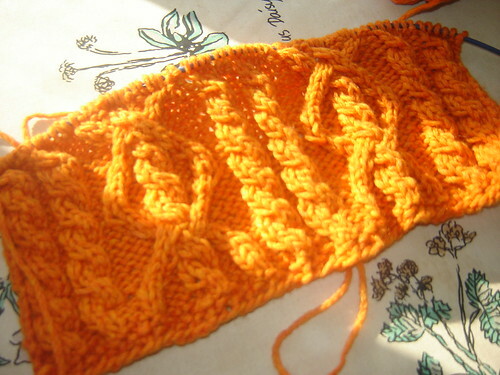 So I might need to frog this one and begin over with a different yarn. Sigh. And another sigh.